Home / Reviews / Lethal Weapon: The Complete First Season Blu-ray Review! Lethal Weapon: The Complete First Season Blu-ray Review! Taking a successful film and adapting it to the small screen has yielded mixed results over the years, who can remember such shows as Eastwick, Terminator: The Sarah Connor Chronicles and Damien? For every Westworld and Buffy The Vampire Slayer there are dozens of adaptations in the Television graveyard. Every time a new one comes around I tend to groan and shake my head. The newest adaptation is Lethal Weapon and The Complete First Season is out now on Blu-ray. 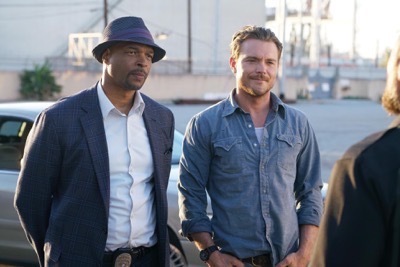 I was more than skeptical that the series could replicate the chemistry that Mel Gibson and Danny Glover had in the 1990s but after tuning in, this Lethal Weapon isn’t half bad if you give it a chance. 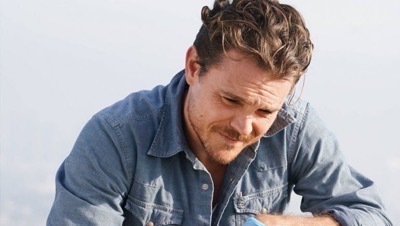 Right from the get go, the two main character of Riggs (Clayne Crawford) and Murtaugh (Damon Wayans) have fully fleshed out back stories which serve them well. It also lends a gravitas to the series that so many other pilots lack. 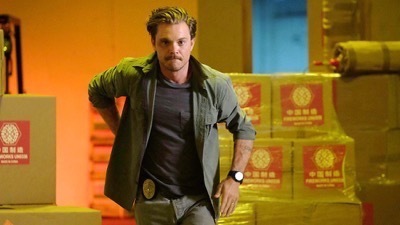 Martin Riggs is a former Navy Seal and in this version from Texas, who has just moved to The City of Angels after his wife, Miranda (Floriana Lima) was killed in a car accident on the way to deliver their baby. Miranda is from Los Angeles and her father (Tony Plana) is an LA City Attorney who pulled some strings to get Riggs the job with the LAPD. Roger Murtaugh is nearing fifty and is on the mend from a heart attack that almost ended his life. He had to have bypass surgery and his wife Trish (Keesha Sharp) is the family’s main source of income. She’s a lawyer and is extremely ambitious but also wants to protect her husband’s health. These two form an unlikely friendship and partnership. 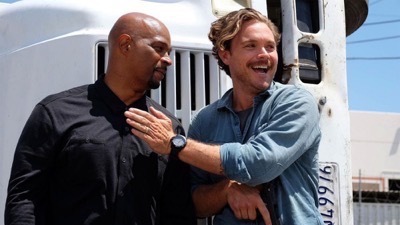 Riggs who leaps into danger and almost certain death and Murtaugh who is trying to make sure that he gets those golden years. Even though Murtaugh tries his damnedest to keep things slow, the pair always end up in a gun battle or a car chase, C’mon this is television after all. The chemistry between the two leads is what really is the glue behind the series. Wayans and Crawford has a unique chemistry and it serves the series well. It does mirror the relationship from the film series to some extent but the two actors are wise to not try and duplicate those characters but make the roles their own, with their own quirks. Even Wayans checking his cholesterol everyday and being hyper protective about his health before Riggs pulls him into a death defying stunt is a nice touch. I admit after the first couple episodes I was pleasantly surprised at how much I enjoyed this series, it has a sense of fun, that is missing from a lot of network series these days and I’m excited to see where the series goes from here. I think the next couple seasons will really allow the actors to explore their characters even more and it will only get stronger. Lethal Weapon: The Complete First Season arrives on Blu-ray thanks to a fine transfer from Warner Bros home video. The picture quality is good, but the sharpness and crispness of blu-ray is sacrificed by putting so many episodes on too few discs. I’m assuming this is a cost cutting measure but it does decrease picture quality. It’s still better than the broadcast version of the series, but it doesn’t live up to what Blu-ray can look like. The colors are good, the outdoor scenes pop and the LA location is given due service. There is some fallout in the darker scenes, but it’s not that noticeable. An Extended Pilot – This is the pilot with an added minute of footage. It says it’s also Uncensored, but I didn’t see a real difference from the broadcast version. There are also deleted scenes for 10 episodes scattered over the course of the three discs. 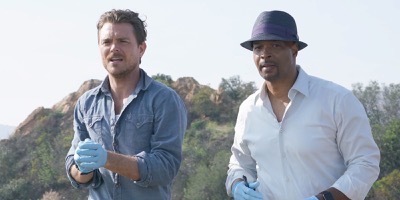 Reloading Lethal Weapon – This is a quick featurette that has some of the actors and creators talking about bringing new life to the Lethal Weapon franchise. Gag Reel – A very quick gag reel clocking in under two minutes. Overall, I was pleasantly surprised by the new Lethal Weapon series. If you were on the fence like I was, I say check it out and give it a few episodes. The actors really fill into their roles nicely and make the characters their own. 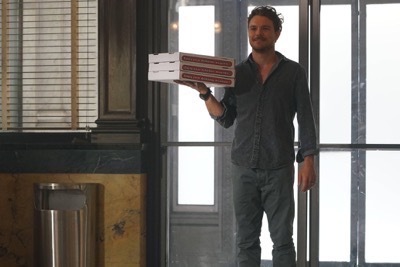 The pilot is a very sharp and while it’s not a series you will remember for years to come, it’s a solid comedy action hybrid that’s escapist fun. I would recommend it. 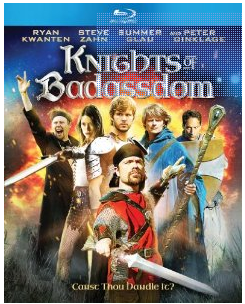 Knights Of Badassdom Blu-Ray Review! Ryan Kwanten And Summer Glau Fight Evil In This Horror Comedy! Warlock Collection 3 Film Set Blu-ray Review! TV Heartbeat Review! 12 Monkeys the Series!?! Yes! 12 Monkeys Infects Syfy Starting Friday 1/16!